The study was published online recently by the Journal of Neurophysiology and is the cover article in the journal’s March 2014 print edition. In their paper, the team led by Johns Hopkins researchers detailed the unusual jump from juggling for fun to serious science. 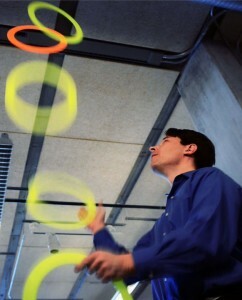 Jugglers, they explained, rely on repeated rhythmic motions to keep multiple balls aloft. Similar forms of rhythmic movement are also common in the animal world, where effective locomotion is equally important to a swift-moving gazelle and to the cheetah that’s chasing it. Specifically, Cowan and his colleagues wanted to look at how the brain uses vision and the sense of touch to control this type of behavior. To do so, they set up a simple virtual juggling scenario. Participants held a real-world paddle connected to a computer and were told to bounce an on-screen ball repeatedly up to a target area between two lines, also drawn on the monitor. In some trials, the participants had only their vision to guide them. In others experiments, whenever the digital ball hit the onscreen paddle the participants also received a brief impulse on their real-world paddle. This mimicked the sensation they would feel if a real ball had actually struck the paddle they were holding. 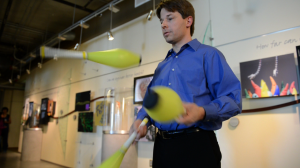 An amateur juggler since middle school, Noah Cowan is now an associate professor of mechanical engineering at Johns Hopkins University. Photo credit: Johns Hopkins University. With the added touch sensation, also called haptic feedback, the participants made about half as many errors in the task, the researchers reported. When humans and animals walk or run, Cowan added, their sense of touch plays a key role: As the runner’s feet touch the ground, they alert the nervous system to adjust the movement of the legs to accommodate changes in the running surface. He also noted that the brain’s ability to instantly integrate information coming from both the eyes and the sense of touch is a critical part of successful running, juggling and other repetitive movements. The researchers say that future studies of the connection between sensory feedback, timing and limb movements could help clinicians to better understand how some neurological diseases such as sensory ataxia might disrupt the brain’s timing of movements by arms and legs. Future findings may also assist engineers who are trying to make touch-sensitive artificial limbs and robots that move as skillfully as animals in the wild. The research was based upon work supported by the National Science Foundation under grants 0845749 and 642 1230493 to Cowan. Ankarali was partially supported by a fellowship from the Department of Mechanical Engineering, Johns Hopkins University. The department is within the university’s Whiting School of Engineering. Digital photos and illustration available; contact Phil Sneiderman.